I was so excited when I spotted this Christmas tree mid-holiday shopping, which was in lieu of the first living-on-my-own pink tinsel Christmas tree that I never got for the condo. (To justify myself I think I spent that money on Yogurtland.) Under this ultra-soft and equally warm velvet coat is the beautiful sequin dress from Lulu's which I received on my birthday--I think it's perfect for the holidays! I love the flash of sequin on a muted color like black; it's the perfect eye-catcher without being too flashy. Let's leave that to the Christmas lights. Beautiful!! I love those wedges and that dress! What a wonderful birthday present it must have been! Great dress and the tree is so beautiful!!! Hi darling! Thanx for your sweet comment and following my blog! 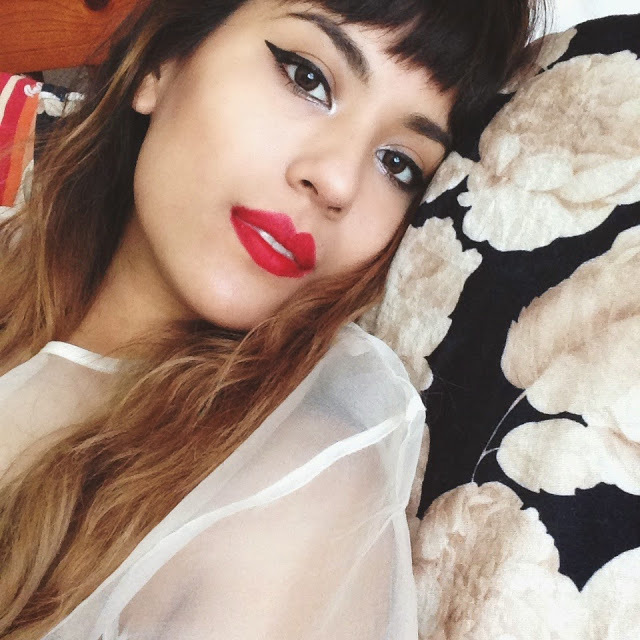 I like your look here and your blog is really cool, I follow you! Like the top of your blog with the Daisy perfume, it's my favorite one! Thank you for your lovely comment and the follow. Glad to discover your blog too! Following back off course. wow your blog is really great too! Wow, your blog is fatastic! I follow you! Thanks for your lovely comment on my Blog and for follow me. I like your fashion posts. All outfits are so amazing and looks great. Like this wonderful dress. thank you for your lovely comment! WOW, i love your style and you're so gorgeous. 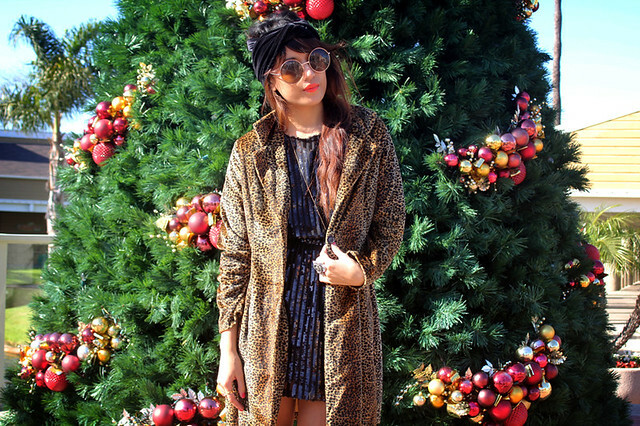 the combi sequin-leopard is amazing <3 and i was wearing a black headband yesterday the way you did. I'm following you now,I leave you my blog,visit me and if you like it follow me back please! Ohh your blog it's great !I love you original outfit ! Very cute. I'm loving the sequins this season. Very festive! Great post. Cute ! I follow you darling! CUTE BLOGG!! that's for stopping by my blog! Yea! I am a NEW FOLLOWER NOW! you are so pretty! what is your ethnicity?? Gorgeous dress! Love your outfit. You look stunning as usual :) love the dress! LOL we have the same suede wedges :D I got them at H&M too, they're great and so comfy! Nice outfit, you look fantastic !!! Thanks for following my blog, I'm follow u back . Thanks your coment in my blog!! Beautiful look, i like the dress!! You look great today :) Love it. Great look, I love the turban! Great shooting (as always). I'm in total love with your cheetah coat! And the dress is amazing! Perfect outfit! Great dress <3 love the sequin and the accessories paired with it. amazing! The dress is so beautiful and I'm in love with your hairband, in this period they are my obsession! Hi, honey! Thank you for visiting and sorry for the delay in answering your comment. I'm following your blog too. The look is just perfect, love it! following you too honey...you're so GORGEOUS!! OMG! I love your dresss!! Soo beautiful! Great outfit! I love that dress, it would be perfect for the holidays!! Nice outfit and also love the style! Oh my god..I seriously love everything about this..
can u share me where did u get the dress and link if possible!! or do you have that dress on ur wardrobe sale?? and m definitely following you too! !